This is one of my favorite categories, a luxury hybrid mattress. I love the extra stability that comes from pocketed coils. I challenge you to find a mattress that is 15″ or greater, and will ship to your door at a price of $1,399 ($1,199 after our discount coupon below). It’s hard to do, but let’s pretend that you can find one. Does the mattress that you found have a 365 day trial period? Does it have a six month lease to own included with that trial period? I’m guessing the answer is no. That’s why it is so easy to recommend the DreamCloud. You aren’t going to get married to the bed, if for some reason it just doesn’t work for you contact DreamCloud and they will arrange for your mattress to get picked up and given to a local charity. There is nothing to lose on this. The company has to be extremely confident in their product to send it out with such a no hassle experience for the customer. The biggest drawback that I can think of for the DreamCloud is that they may end up selling too many of these. As we have seen before companies that are just too successful at selling tend to have some growing pains. Those pains generally show up in the form of shipping delays. Currently, DreamCloud isn’t experiencing shipping days so you should expect delivery within 5-7 business days. Mine shipped to me in 2 DAYS! Who Should Buy the Mattress? What is Inside the Mattress? My DreamCloud mattress review wouldn’t be complete without stating that it is a 15” luxury hybrid mattress combining the best of latex, memory foam, hand crafted Cashmere, tufting and coil technology to provide the best sleep money can buy. The DreamCloud isn’t messing around with the term Luxury. 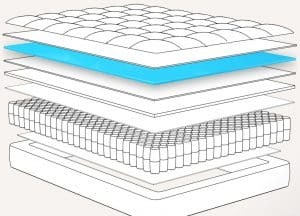 This mattress boasts 8 layers of cover, foam, latex and individually pocketed coils. Let’s start from the top with the cashmere cover. For the fourth layer the DreamCloud is loaded with a natural latex, which will help bring the mattress that bit of bounciness that I love. Seventh layer is where the real magic happens. They have separated their pocketed micro coils into 5 different zones, making ideal support for many different types of sleepers. They also have reinforced edges, which is something I dream about when I test out hybrid mattresses. I love the feel of “hidden” coils. I enjoy the additional support of the coils, but the DreamCloud takes it up a notch by making sure that you can’t feel them. It’s a huge win for those of us who sit on the edge of the bed to put on our shoes and socks! Each DreamCloud is hand-tufted. A process that is usually reserved for super high end mattresses that typically cost $4,000-6,000. This process takes up to 2 hours to complete, and ensures that the mattress will have consistent firmness. The result is a mattress that won’t have the soft spots that are probably causing you to search for a mattress today. The DreamCloud meets all US CPSC fire resistance and flammability standards. I discovered 2 things today when I moved the DreamCloud into my spare bedroom (so I can test a new mattress). It is Sturdy and will stand on its side without any assistance. Many other mattresses do what I call “Tacoing”. They kind of collapse on themselves, and fold into the shape of a taco. Picture a mattress folding up on me. Trust me it happens. There is no chance that a DreamCloud will taco. The mattress isn’t flippable, but the bottom cover is nice enough that you could sleep on it if you wanted to. There is so much attention to detail put in this mattress. If you haven’t caught on, this mattress SCREAMS luxury. This mattress has universal appeal and is good for all types of sleepers. This is my clear favorite for the hybrid category. It is also my top pick for best mattresses for big and tall people, yeah I put that to the test also with someone three times my size. A key difference between the DreamCloud and other luxury hybrid mattresses is their lease to own program. This is a no credit check program. If you have a job, and a bank account you can get a DreamCloud and pay for it over a six month time period. This really works well with their trial period. They wouldn’t have both of those generous programs if they didn’t think that they were building a great product at a great price. The DreamCloud essentially earns a place in your bedroom each month. If you aren’t satisfied they will refund your money and arrange for the mattress to go to a local charity. He is about 6’8″ tall and weighs in at around 350 pounds. The people at DreamCloud were confident that their bed would work for a person that big so they sent him one and let him sleep test it. Fast forward a few weeks and see how happy he is on it. Initially, he was a bit worried as his last 3 mattresses have failed on him. I assured him that he would get a luxury mattress that will hold up to his size. Is there a better fit for a giant than sleeping on a cloud? Why you should consider buying the DreamCloud! The name says it all, DreamCloud~ so dreamy ! Say goodbye to tossing and turning and grab your one way ticket to DreamCloud. Finally, a well-crafted sturdy yet luxurious and comfortable mattress at an AFFORDABLE price, all in one. And as if that wasn’t enough, the DreamCloud warranty is one of the strongest warranties in the mattress industry, it’s Everlong. They will even re-condition and clean it for as long as you own and use it. 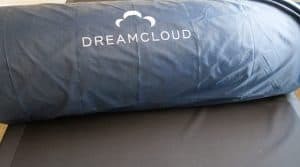 Dream Cloud also offers 365 free night trial and free shipping and returning (but this one is a keeper, there won’t be any returning here). You are one click away to getting the perfect coil and foam combo in one high quality mattress you can finally afford. So stop dreaming of the perfect bed and get that plush cloud feel you’ve been looking for right now. What Type of Bed Frame Works for this Mattress? 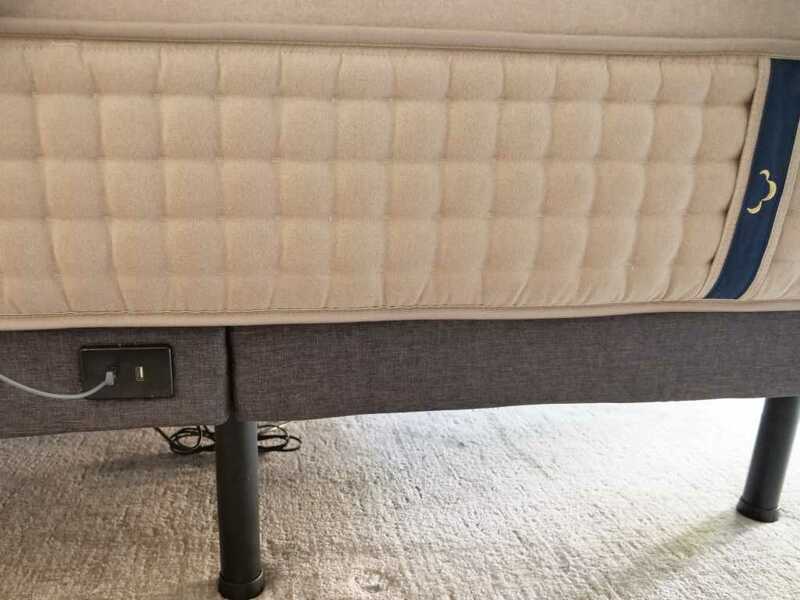 The thickness of the mattress, a full 15″, makes it a bit of a struggle for an adjustable base. I’m hoping that it needs a little more time to break in, but in the first week of testing the DreamCloud is in the good tier of adjustable bed conformity. Their everlong warranty doesn’t encourage “unusual” places for your mattress. They are funny about it though, as they may add you to their affiliate program if your DreamCloud is in an unusual place. Note, the pricing on the Twin and Twin XL may change, as they aren’t currently being offered. The other thing to note is that the Cal King and King are really heavy, so you will need a partner to help you move it around and set it up. Financing is available through Affirm. It is a serious workout, they packed a lot of bed into a small and very heavy bag. Make sure you invite a friend over to help you “unbag” it. Also take some pictures, I’m sure the folks at DreamCloud would love to add them to their website. I live in Arizona which is just a few states over from their distribution center in Washington State. My shipping time was only 2 DAYS! I’m sure if you are on the east coast it will take a few days longer. Be patient and gently remove both bags, without cutting into them. Each of them can be repurposed for storage or something fun like camping. The Queen sized mattress is heavy, but I was able to move it around with my husband. The California King size is in another league. It is so heavy that shipping and moving it require 2 adult males to move it around. It is heavy enough that it may ship on a pallet for additional support. I used the DreamCloud in my best mattress protector video. I was scared that the mattress protectors that I used could fail and mess up my mattress, but I selected it because I knew that DreamCloud offers a one time cleaning service (I made that bold in the pros section above). Worst case scenario, I could have tested that service out. Fortunately, I didn’t need to as the mattress protectors did their job and kept it clean. If you decide to watch that video skip to about 10:25 to see how much liquid was pooling in the tufted section of the DreamCloud. I thought for sure that the liquid would get through the mattress protector. would you recommend the dream cloud for a 5’5 125lb side sleeper and a 5’11” 150lb side/back sleeper? or is there a better bed you would recommend for us? thanks! sorry, I should mention I’m from Canada… might impact your recommendation. I would check out the douglas douglas douglas or their a little bit more expensive novosobed as I think they are the best deals available in Canada. I would love to have this mattress to well. Great giveaway! I need a new mattress. It is firm for sure. My 350 pound friend has been sleeping on his back for almost a year and he says that it softened up a bit after a few weeks but it is still firm enough for him. How was the motion transfer on this mattress? It is pretty good, and I would almost say unique in that department. The tufted construction give it fairly large individual squares, so unless you are on the same square you just don’t feel your partner moving around. Do you see any problem placing on box springs? We have a recently purchased 3 month old mattress with box springs and the mattress is a disaster – too soft. Am considering the Dreamcloud and hoping to use the box springs that rest on a platform bed frame. What do you think? Thank you. As long as the box springs are level you shouldn’t have a problem. One thing to keep in mind is that the DreamCloud is so big (15″ thick) that you may want to skip the box springs to bring down the height, or get a ladder to help you climb in and out of bed! So, I have a traditional bedframe that will accommodate the thickness, BUT I currently use box springs with my king bed. Would a frame with plywood instead of box springs be okay with this mattress? As long as the plywood is sturdy you can toss the box springs. If it is made up of slats make sure they aren’t more than 3 inches from each other. Dreamcloud had shipping issues in February/March 2018. I ordered my mattress on 2/18/18 and did not receive it until the first week of April. I think that they have resolved the issues and are shipping much faster now. Thanks Jeff. I don’t think they would have lowered their prices back down to their launch price if they didn’t solve their shipping issues. Sometimes the sales force can get ahead of the factory, for any popular product. If the mattress is returned for whatever reason, does it get picked up as is? Or does it have to be packed back up into the bag? Matt, that is a good question and I hear it a lot. If it doesn’t work for you DreamCloud will arrange to have it picked up and donated to a local charity. It won’t/can’t fit back in the bag that it will ship in (the bed ships highly compressed). Personally, I use the bag that it ships in as a huge bag for camping gear. Which would you say would be the next closest comparison to it between the Aurora signature and the Alexander signature hybrid? Thank you. It is fairly similar to the Nest bedding alexander hybrid. Except that the alexander is more of a pillow top while the dreamcloud is more like one cohesive unit. The Brooklyn bedding signature is probably a little closer to the feel (lower price also). They don’t offer a twin size?? It has been listed as sold out since the company launched. I have been thinking about why they don’t have one and the only thing I can think of is that it would be overkill at just a twin size. I don’t think there are that many people that sleep on a twin bed that also want a 15″ thick mattress. Then I thought well why don’t they have a twin XL for adjustable beds? I came up with what must be the same answer. At 15″ it’s too thick for most adjustable beds so a split king wouldn’t really be a good option. TLDR, my guess is that they won’t ever make a twin or twin xl dreamcloud. Question: What would you rate this mattress on the hardness scale? I saw you rate many mattresses in terms of softness and firmness on a 1-10 scale. Where would you rate this on that scale? It is around a 6.5 to a 7 on my scale, which I just updated. Takes a bit to get it loaded on the system though. I ordered my mattress Jan 27. 13 days ago. And it still hasn’t been shipped to us in AZ. Their website says 7 business days and you are at 10, so I’ll ask them if they have an update on the delay. It took them 3 months to get me a mattress. I contacted them every week, and every week they told me the same thing “it will be shipped out by the end of this week”. What size did you order? My queen shipped in less than a week, but that was back in January.